As I promised several weeks ago, in this blog I’m writing about some of the studies published in the latest issue of the Journal of Addiction Medicine, the journal published by ASAM (American Society of Addiction Medicine). All of the following articles were in the last issue, May/June of 2017. The opioid situation in the U.S. has temporarily claimed a big chunk of our attention, but elsewhere in the world, amphetamine and methamphetamine use disorders are more common than heroin and cocaine use disorders combined. In fact, amphetamine and methamphetamine are second only to marijuana worldwide as the most commonly used illicit drug. Many scientists have been working to find a medication that will help in the treatment of patients with this disorder. Thus far, only psychosocial treatments have been helpful, including individual and group therapies using motivational interviewing, cognitive behavioral therapy, 12-step therapy, relapse prevention, and contingency management strategies. These treatments do improve outcomes, but are at best only moderately effective. In Runarsdottir et al., extended-release injectable naltrexone was studied in 100 subjects with amphetamine use disorder in a randomized, placebo-controlled study done in Iceland. This authors of this study postulated that the opioid blocker naltrexone could block the opioid receptors and thus the pleasurable effects on any endorphin-mediated dopamine release resulting from methamphetamine use. Preliminary studies in rats, primates, and healthy human volunteers suggested naltrexone could be effective, so this study on human subjects with methamphetamine use disorders was undertaken. Subjects in one arm of the study were randomized to the usual psychosocial treatments plus placebo injection, and the other arm got the same psychosocial treatments plus active extended-release naltrexone injections. Unfortunately, in this study, extended-release naltrexone did not show any statistically significant benefit over placebo. Both groups had high rates of drop-out at around 50%, which hampered the study results. However, the study’s authors postulated that their selection criteria for the study may have pre-chosen subjects with more severe use disorders. This study’s results were disappointing. We would love to have a new and effective was treatment for amphetamine and methamphetamine use disorders, but this study didn’t show benefit from extended-release naltrexone for use in this disorder. Another article was about a newer product containing buprenorphine: the rapidly-dissolving buprenorphine/naloxone sublingual tablet (brand name Zubsolv). It’s been on the market for a few years, and previous studies showed it works as well as other sublingual buprenorphine products on the market. This study took patients from the previous studies and extended their treatment with this product for twenty-four more weeks, to evaluate the safety of longer-term treatment. As a secondary goal, study subjects were evaluated for their quality of life, opioid cravings, and their addiction severity. Of the 665 patients who entered this second-stage study, only 44% completed the 24 week extension study. So that’s not great – we would like to see patients retained in treatment. The authors say patients withdrew due to being lost to follow-up, patient nonadherence to medication, and patient request for discontinuation. But of the 44% of patients who finished the 24 week extension study, improvements were seen in their addiction severity, in their quality of life, in their employment status, and other measures. This means that the rapidly-dissolving buprenorphine tablet was found to be as safe as other similar products on the market, and the benefits of continued treatment persisted throughout this prolonged study period. The high rate of discontinuation is concerning, but certainly not unusual. In fact, this drop- out rate was similar to studies done on other sublingual buprenorphine products. I see this at my work. We use both buprenorphine and methadone at the OTP where I work, and drop-out rates are higher for patients on buprenorphine. They tend to bounce in & out of treatment more often than methadone patients do. I believe, but can’t prove, that the milder withdrawal gives patients less incentive to make sure they dose daily. Patient drop-out is undesirable for all concerned. When a patient drops out of treatment at an MAT, relapse rates are very high, and risk of death may increase as much as eight-fold. From that point of view, I might be tempted to regard methadone as a superior treatment. However, I know some of our buprenorphine patients would never consider starting methadone, often citing the difficulty of tapering off methadone as the reason. So offering buprenorphine attracts patients who may not enter treatment otherwise. Another article in this copy of the journal, titled, “Methadone-Induced Hyperhidrosis Treated with Oxybutynin, by Hong et al., was a case study of a patient with pronounced sweating caused by methadone. Pronounced sweating from any cause is termed “hyperhidrosis.” All opioids can cause this, including methadone. As the author points out, we think this may be caused by muscarinic receptor activity in the part of the brain that controls body temperature. This case study is of a patient who stabilized on methadone 100mg for the treatment of his opioid use disorder, but had severe sweating, to the point he had to change clothes multiple times per day. This patient went to his internist, who prescribed oxybutynin, a medication also known under the brand name Ditropan. It’s used for overactive bladder disorders, and works through its anti-muscarinic activity. The patient had resolution of his excessive sweating within two days, so the treatment was a success in this case. I think I will start recommending to my patients with excessive sweating see their primary care providers for a trial of oxybutynin. There are some pitfalls…it can lead to urinary retention, of course, and that’s always vexing when we ask patients to give urine drug screens. The last issue of Journal of Addiction Medicine, the official journal of the American Society of Addiction Medicine (ASAM), was full of interesting articles, and I plan to blog about some of them in upcoming entries. I’m pleased to be a member of ASAM, recognized as the premier professional society dealing with substance use disorders and their treatments. This organization has members with great enthusiasm, and hosts the best conferences I’ve ever attended in my career as a physician. The journal ASAM publishes is also top-notch. They publish articles pertinent to issues addiction medicine physicians face daily. They are practical for my everyday use. Today I’m blogging about their drug testing recommendations. Recently there’s been an upsurge of laboratories offering fantastic deals to physicians and patients which in the long run may turn out to be not so fantastic. ASAM published a document giving evidence for the most appropriate way to use drug testing in the setting of addiction medicine practices. This document underwent extensive evaluation by experts in the field, using a data search for the highest quality of evidence, and then, using the RAND/UCLA appropriateness method, decided the importance of all of the data gleaned. Then an expert panel judged the ratings of all statements concerning drug tests. IRETA (Institute for Research, Education and Training in the Addictions), the prestigious group in Pennsylvania, also contributed to the document. ASAM mailed a copy of the entire document, titled, “The Appropriate Use of Drug Testing in Clinical Addiction Medicine,” along with the latest issue of the Journal of Addiction Medicine. I recommend every physician working with patients with substance use disorder read this document and use its information. The document isn’t meant for federally mandated workplace forensic testing, only for addition medicine practice. In this blog, I’m going to point out a few of the ideas in the document and comment on them. The ASAM document points out that drug testing technology is useful only when the technology is used appropriately. This reminds providers that we must understand the underlying principles of drug testing, know the limits of this technology, and remember it’s only one tool in our toolbox of patient evaluation. They remind us that there’s only limited evidence to show that drug testing improves patient outcomes. More recent studies suggested that when drug testing is used correctly and integrated into making treatment decisions, outcomes may be improved. Physicians shouldn’t use drug tests in a punitive, confrontational way. Rather, if we get an unexpected result on a drug test, it should be the beginning of a conversation with our patient about the result, not the end of treatment for the patient. Some patient advocates point out that if patients have no adverse consequences for positive drug screens, self-report of drug use would be sufficient. That’s probably true, but if a patient continues to use drugs while in treatment, a change in treatment may be needed. Patients view intensification of counseling as an adverse consequence, so there we have a dilemma. As a physician, I may feel that positive urine drug screens indicate a need for more intensive treatment, but my patient doesn’t want that, and feels that I’m being punitive for insisting on more intense treatment. That’s not unique to addiction medicine. In primary care, I often recommended patients participate in more intense treatment for a chronic disease. Sometimes they felt like I was making a fuss about nothing. For example, I had a patient with extremely high blood pressure. He ran 220/130 on a regular basis, and refused hospitalization saying, “That’s normal for me. That’s just what my blood pressure runs.” OK, maybe that’s true, but it’s still dangerously high. When my patient refused to take a second medication for blood pressure, refused to get necessary lab tests done, and missed follow up appointments, I had to decide whether to continue to see him as a patient or dismiss him for non-compliance. He was a time bomb, at high risk for a stroke or heart attack. If I kept seeing him, maybe I could gradually convince him to take more blood pressure medicine. By continuing to prescribe blood pressure medication, I was doing something to reduce the possible harm to him. But if he had a large stroke and died under my care, am I partly liable because I kept seeing him despite his non-compliance? I eventually decided I couldn’t keep seeing him since I was more worried about his health than he was. He did view my dismissal of him as a patient as punitive. I guess it was, in a way, yet I hoped he’d find a doctor better able to convince him to take care of his disease. Drug testing should be therapeutic. This means that that the drug test should be used as a tool, but not a club. A positive test can serve as a starting point for a discussion about denial, motivation, and about the actual substances used. A positive test can become a starting point that leads to helping patients understand some of their triggers for use. For example, when I talk to a patient about an unexpected drug test, I say something along the line of, “Tell me about the cocaine (or whatever drug).” I want my patient to talk through how the drug use occurred, especially about what was going on just before they decided to use the drug. Who were they with, what were they doing, what was their mood and attitude like, how was their stress level…all of these things can lead to helpful information. Often, before the actual drug use, there’s a sequence of events leading up to the use. I tell patients that relapses often contain valuable information they can use in the future, and since they didn’t die from the relapse, they should mine the experience for all data that can be helpful in the future. This should be a collaborative process, assuming the patient sees the drug use as change-worthy behavior. If the patient sees no problem with using a drug, a completely different approach is needed, because you’re trying to sell a dog to someone who prefers cats. ASAM’s document us that the intent of the test is to discover whether a substance has been used within a particular window of time. That would seem obvious, but sometimes providers expect the test to tell them more than that, or less than that. For example, if a patient sample tells us whether a substance has been used over the past 4-5 days, it will not tell us if the patient is impaired or under the influence of that substance at one particular time over the past 4-5 days. A test can’t give us information outside of the test’s expected window of detection. That should be obvious, but it bears repeating, because some providers can get confused. For example, a non-medical acquaintance who claimed to be an expert in toxicology recently told me his organization planned to use hair testing for buprenorphine patients. That made no sense to me. The window of detection for hair is great for weeks to months, depending on the length of the hair sample, but it won’t tell me if my patient has used drugs over the past few days or week. That data won’t be part of the hair follicle record until more than a week from now. I would regard that as stale data, not as helpful to me clinically. The ASAM document agrees, saying that hair drug testing is not appropriate for most addiction medicine treatment settings. Also, I would add that it’s costly, not timely, and possibly discriminatory, since dark hair concentrates drugs more than pale hair. The ASAM document made a few points I had not considered. One would expect that any patient in treatment for substance use disorder would know what her urine drug screen would show. That’s not always the case. For example, with heroin, the person using the drug may have no idea that it’s been mixed with fentanyl, a much more powerful opioid that heroin. That’s a common practice now, since drug cartels have discovered it’s cheaper to make fentanyl than harvest opium and process it into heroin. That’s some valuable information for a patient who thinks he’s using heroin. If fentanyl, a much more powerful opioid than heroin, is contained in the product he’s using, he may be more likely to do “tester” shots to avoid overdose. I’ve had patients who use marijuana suddenly test positive for both THC and methamphetamine. Was the marijuana mixed with methamphetamine? If the patient knows for sure she hadn’t intentionally used methamphetamine, it must have been mixed with the marijuana, possibly to give the user a different effect. This gives this person information about the contents of the drug she’s buying, which can be useful information for her. Of course, when patients use pharmaceutical-grade drugs like oxymorphone, oxycodone, and the like, users know what they are getting. Obviously that different with street drugs. This guide about drug testing also reminds us that drug tests can help physicians decide if mental health symptoms can be due to mental illness or drug use. For example, patients who have used methamphetamine often have psychotic symptoms. They can be paranoid and have visual and auditory hallucinations. In the past, when I’ve seen patients with these findings, I’m often relieved to find methamphetamine on their drug screens, because there’s a good chance the clinical signs are all drug-induced, and not a devastating mental disorder like schizophrenia. These are only a few of the helpful, more big-picture ideas in the ASAM document. I’d like to encourage any physician or provider treating substance use disorder to get and read a copy of the document. I just got back from the yearly American Society of Addiction Medicine conference. As always, it was a treat. It’s so refreshing to be surrounding by other physicians who know addiction is a treatable illness and not a moral shortcoming. I feel revitalized from being around people who also love treating people with substance use disorders, and who also love seeing people get well and get back to being themselves. This conference was huge. Over 1800 people attended. When I went to my first ASAM meeting in 2004, I think there were around 300 attendees. What a difference! This year, I sensed even more hopefulness and enthusiasm than in past years. Last month, Addiction Medicine was finally recognized as a legitimate specialty of medicine. Finally, we got recognition that we have a substantial body of science with data that supports the work we do. Recently, there’s more conversation about treating people with opioid addiction. We see television shows, online articles, and blog posts about the opioid addiction epidemic and the death toll it’s exacting on our nation. Even President Obama recently emphasized the importance of treating people with opioid addiction, and the obligation of incorporating medication-assisted treatment. More federal and state grants are available to start programs to help people with substance use disorders. All of these recent changes encouraged me, but the speakers at the ASAM conference pushed my enthusiasm further. On the first session of the first day, Dr. Nora Volkow, director of NIDA (National Institute on Drug Abuse), spoke. She was her usual brilliant self, giving a concise summary of this nation’s present opioid addiction situation. She discussed many of the same studies I’ve highlighted in my blog over this past year, so I felt good about that. Next to speak was Dr. William Miller, the “father” of Motivational Interviewing. His lecture, titled “The Power of Empathy in Addiction Treatment,” was a gift. It reminded me of why I love what I do, and how I can continue to improve as a clinician. I also went to his ninety-minute session about the basics of Motivational Interviewing. I’ve read all three editions of his book, “Motivational Interviewing,” and I’ve seen videos of therapists using MI as a counseling technique. Motivational Interviewing is an evidence-based method of counseling people in order to help them change. MI sounds much easier than it is. It also looks easy when I watch other people do it, but it’s much more difficult than it looks. Fortunately, my fiancé is a “MINTee,” meaning he’s one of the Motivational Interviewing Network of Trainers for Motivational Interviewing. I figure that can’t help but rub off on me. Plus, he helps train the counselors at our local opioid treatment program. In my obviously biased opinion, he’s helped our counselors become much better at their jobs, which ultimately benefits our patients. I went to many other ASAM sessions – from a lecture on contingency management techniques to a discussion about buprenorphine doses above 16mg. All were excellent. Even though it’s impossible to attend all the sessions, since many times there were four of five going on at the same time in different rooms, I plan to listen to the recordings of them all on ASAM’s website when they become available. And I will return to work a better, more enthusiastic doctor. I’ve neglected my blog lately, because I’ve been doing extra reading, preparing for my American Board of Addiction Medicine (ABAM) re-certification exam. I took the exam yesterday, so now I’ll have more time. I took (and passed) this test for the first time in 2004. Doctors who wish to remain certified in Addiction Medicine need to take the test (and pass it) every ten years. We also have to demonstrate commitment to lifelong learning by doing a certain number of continuing education hours each year, and a few other things. This exam used to be administered by the American Society of Addiction Medicine (ASAM). The first time I took the exam in 2004, ASAM sponsored the testing. But in order to get recognition from the American Board of Medical Specialties, a separate entity had to be created, and ABAM was born in 2007. ABAM’s purpose is to establish standards for physician education in the field, to assess competency of the physicians it certifies, and to track life-long learning of these physicians. I didn’t mind studying for the exam, because I find the material to be so interesting. 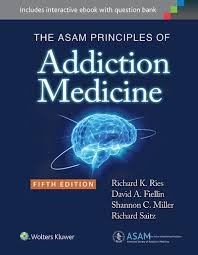 Our main textbook is “Principles of Addiction Medicine,” and at over 1700 pages, it’s a long read. There’s also a great review course, sponsored once every other year by ASAM, called “ASAM’s Review Couse of Addiction Medicine.” I couldn’t go to the meeting in Orlando, Florida, but I listened to the whole thing on ASAM’s e-learning site. On that, I could listen to each of the over 20 hours of information over and over again if I desired. The lecturers were fantastic, and among the top in the field. Even though it’s supposed to be a review I always learn new things. It was a fair exam. I won’t know if I passed until February of 2015, but I’m feeling confident. If you want to know if your physician has been trained in Addiction Medicine, ask her if she is a member of ASAM, or is certified by ABAM. Doctors don’t have to be certified to be good, but if you want to know for sure that your doctor is well-educated, ask about that certification, or the equivalent in the psychiatric field, the American Association of Addiction Psychiatry.